Well, the heat is back. Yuck. Humid too. 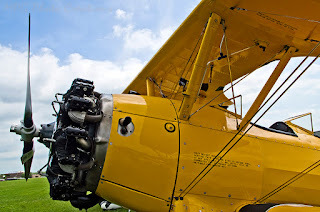 Here is a Stearman Bi-plane close up that I captured at the Bi=plane Fly-In in Junction City. Love these planes. They were Navy training planes and several have been restored and are still flown. Some give rides. Hmm, I replied to this one but it does not appear. Weird. Thanks so much for the visit and comment Ann! Really appreciated!